I have Glennon of Momastery (one of my favorite non-book blogs) to thank for the recommendation to read this book. 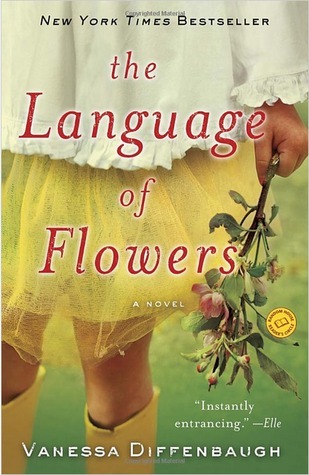 Glennon chose The Language of Flowers for Momastery's November book club. I've never participated in an online book club before, but I loved the summary and decided to try something new. The Language of Flowers was a wonderful book! It's a first person narrative, told from Victoria's perspective. The book alternates between Victoria's present day life and her past, growing up in the foster care system. Victoria's childhood was heartbreakingly sad to read about. To imagine a child with no one to love them made my heart ache. Especially being a new mother myself. I can't imagine not having my baby...neither can I imagine what my life would have been like without my wonderful parents. The most unique thing about The Language of Flowers is in fact, the book's focus on the Victorian language of flowers. I knew that people use to send flowers instead of love letters, to send a certain message while courting, but that's all I knew about the language of flowers. To get sort of an education on that topic was really fun and unexpected. I loved how Victoria uses flowers to express her emotions, since she never really learned how to communicate emotion in a healthy way. There were times I had a hard time connecting with Victoria. She made a few decisions I neither agreed with or completely understood. But in the end, she had grown and changed so much that I really respected her. Diffenbaugh's personal experience with the foster care system made Victoria's childhood read very authentically. I loved the writing style, pacing and emotions. I highly recommend this book and will definitely read Vannessa Diffenbaugh again! Sounds great... totally added to my Goodreads! :) Thanks for sharing! O I liked this one too! It's one of those books that really left an impression on me. So glad you liked it. I loved this book. She was so flawed and the story was often sad, yet it was still hopeful. That whole bit with feeding the baby. I swear! I thought I was going to start lactating or something.